(L-R) are: Nick Masso, CWI head mechanic; Todd Parker, CWI operator; Ed Parker CWI operator; Justin Melvin, Empire Crane New England general manager; Kyle Pitre, Empire Crane service tech; and Henry Simmelink, Terex mechanic. 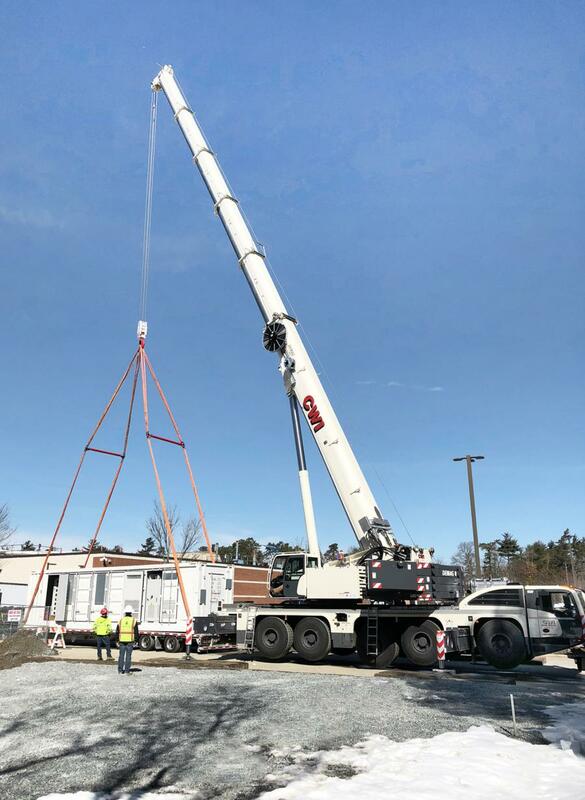 CWI Crane & Rigging has purchased a new 300 ton (272 t) capacity 2019 Demag AC250-5 from Empire Crane Company's New England branch. Owner Chet Chludenski had several reasons for choosing this model including its safety features, IC-1 Plus variable outrigger flexibility, and the Demag and Empire Crane product support teams. "The road ability of the carrier for Massachusetts being under 130,000 lbs. with no counterweight is a huge plus for us because we won't need to get new permits every time we move to a different job," Chludenski said. With a maximum system length of 356.6 ft. (108 m), the 5-axle 300 ton capacity crane is going to give CWI a huge advantage because it will no longer have to rent cranes in the 300 ton class. Along with larger jobs, it also is looking to do more work in the solar sector setting modules for storing energy. According to the Solar Energy Industries Association, in 2018 10.69 percent of Massachusetts electricity was solar powered and they expect this to double by 2024. "You see more and more solar energy fields popping up all over Massachusetts; the AC250-5 is sure to be very busy and our team will be there to support it every step of the way," said Empire General Manager Justin Melvin. The crane's first job was helping to install two 65,000 lb. battery modules that are used to store solar energy. This job was completed for ELM Electric, at Acushnet Co in New Bedford, Mass., a leading producer of golfing products such as Titleist golf balls. The stored energy will be used during peak hours to help keep energy costs down. To complete the lift, CWI set the new AC250-5 at a 45 ft. (13.7 m) radius with 50 ft. (15 m) of rigging and spreader bars. This allowed them to have much more capacity than needed to successfully complete the job safely and efficiently. CWI head mechanic Nick Masso and operators Ed and Todd Parker worked for fourdays with Empire General Manager Melvin, Empire Service Tech Kyle Pitre, and Terex Service Rep. Henry Simmelink to PDI and familiarize the team with all aspects of the crane. This included going through the new IC-1 Plus system that will allow them to use asymmetric outrigger setups without loosing lift capacity. Pitre is a Demag Qualified Technician who has completed many technical training courses along with years of field experience. "IC-1 Plus in the new generation of Demag [all terrain cranes] is what really defines Demags from other AT's in the market," Pitre said. "We've had a strong relationship with Empire Crane over the past 25 years," Chludenski said. "I purchased this unit from them because of the sales department's flexibility to make this deal happen, and the knowledgeable and local service department." CWI Crane & Rigging was established in 1969 and continues to be a family owned and operated crane service company located in central Massachusetts. They have a fleet ranging from 30 to 300 ton capacity. Each of its cranes is maintained to meet the strictest safety measures ensuring jobs are completed safely, efficiently and economically. Empire Crane Company was founded by Paul and Luke Lonergan in 2002. It is an authorized dealer of Terex, Tadano Mantis, Kobelco crawler cranes, Shuttlelift carry deck cranes, Manitex boom trucks, Wolffkran tower cranes and Magni telehandlers. Empire Crane offers sales, parts, service and rentals at its offices in Syracuse N.Y., Bridgewater, N.J., and Boston Mass. Solar Energy Industries Association (SEIA) is the driving force behind solar energy and is building a strong solar industry to power America through advocacy and education. It represents all organizations that promote, manufacture, install and support the development of solar energy.